UPDATE: 2/26/2016: I’ve kept the original article in tact below, in its entirety, so everyone who reads this can learn from it. I have since drastically changed my thoughts on privilege, and openly & adamantly declare that I am incredibly privileged. I highly encourage everyone to read the comments by two of my good friends, NB & Janice. Both are exceptional human beings, and I can’t thank them enough for their friendship, as well as the huge knowledge & experience bombs they dropped on me. I agree with both of their comments 100%, and you should absolutely read through them in their entirety. For everyone, to learn something new, or perhaps even change their behavior for the better. My blog is called “An Alternate Route” because I do a lot of things out of the ordinary. Some are well thought-out; others, like this one, aren’t. But it’s that unique journey by which I learn and grow. And I thank you all for being a part of that journey. Now that 2 days have past, I’ve had time to let it sink in, and hear some reactions from friends & strangers alike, I’d like to share this with you. 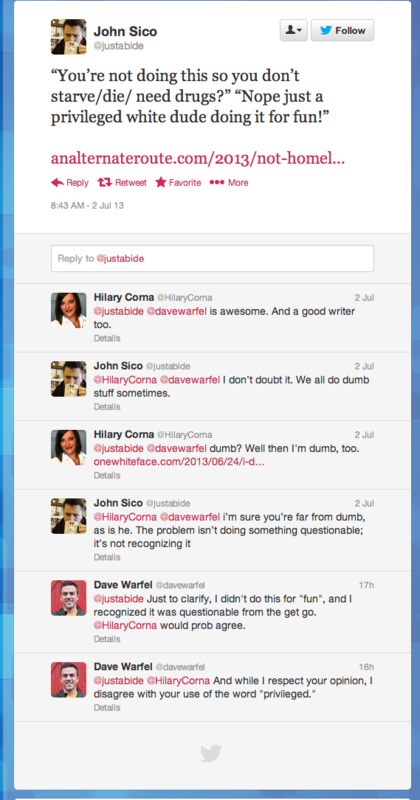 I think John follows Hilary. I don’t follow him, nor do I know who he is. Nonetheless, he had something interesting to say about my experience. I’d like to add my thoughts (in more than 140 characters). So what was the goal? I’ll be honest, I didn’t think too much about it before I did it. I knew it would be uncomfortable, and most things that challenge us out of our comfort zone, end up building character. Aside from stepping outside of my comfort zone, I just wanted to raise my sense of awareness, and take in what happened around me. I’d also like to mention that I specifically left off the words “Not Homeless” from my sign. Some really good friends of mine thought that might be offensive, and had the potential to really hurt someone’s feelings. Extremely valid point, and thus, I decided to leave it off my sign. I recognized what I was doing was questionable. But if we all shied away from doing questionable things, our world would remain stagnant, and life would have no purpose. I’m not sure what John meant when he called me a “privileged white dude”—especially since we know nothing about each other, have never met, etc.—but by definition, I would certainly not consider myself to be privileged. I was raised by two loving parents, who taught me many important life lessons, supplied food & shelter, and paid for countless extra-curricular activities growing up, not to mention helping big time with college. And I realize that, to no fault of their own, many people don’t have access to these things growing up. So, perhaps in that sense, I am privileged. However, those same parents also taught me to work hard for things. That I had to do work in order to earn allowance. I had to eat my vegetables before I could eat ice cream. Likewise, my coaches made me earn a spot on the team, with hustle & countless hours of practice. My employers put me through stringent interview processes with many other candidates before awarding me the job. I’m not immune from anything. I play by the same rules, and face the same consequences, as every other citizen of this country. And I challenge anyone to bring to my attention a special right or advantage that I’ve been granted because of some special circumstance that I didn’t have to work for. 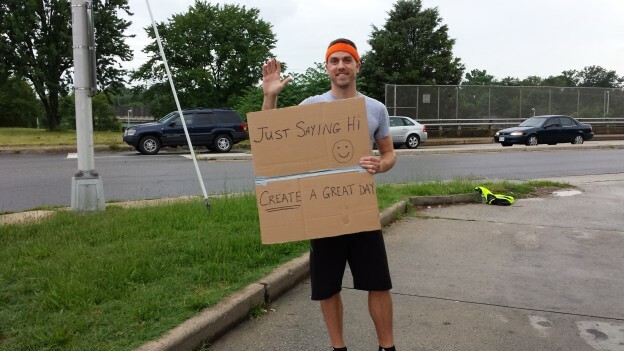 In terms of the last definition, “having the rare opportunity to do something that brings particular pleasure”… there is nothing rare about the opportunity to stand out on a corner, with a cardboard sign, smile & wave. Every person who has at least one arm could do exactly what I did (heck, even if you have no arms, get someone else to write it & lean it up against your chest from your wheelchair). That’s the beauty of this challenge. The barriers to entry are about as low as they get. I found it interesting that John used the words “white dude” to describe me. He may have meant nothing by it, but I interpreted it as an assumption that a majority of homeless people are some race other than white. It appears, at least from the stats I could find, that a majority of homeless people in this country are non-white. However, 35% is still a decent chunk. And it does vary greatly based on geography (big city vs. urban vs. rural). The two things that stand out most to me are: the number of homeless families with children and the percentage whom have had things stolen from them. And to think, the homeless guy who walked past me the other day actually tried to give me money. Take what you want from these stats, but please think twice before assuming why, what or who is standing on the corner with a sign. They might not be who you think, and it’s possible they’ve dealt with more than you can possibly imagine. Well… that was extremely uncomfortable, and fantastic, all at the same time. What an interesting experiment & rewarding experience. First off, big thanks to my friend, Hilary Corna, for the idea/dare. I would have never thought to do this otherwise. Just before heading out. I ditched the jacket when I got to the street corner. A quick overview of my experience, by the numbers. For more in-depth commentary, read on past the list. 19 – car horns that sounded because of the sign. One lady was too focused reading the sign, she didn’t see the light change. And someone got impatient. 1 – LOL, as in, laugh out loud. Yup. I heard her across 3 lanes of traffic. Less than 10 minutes into standing on the corner holding my sign, a young man wearing a trash bag walked by (it was raining fairly hard for 1/2 my time out there). I said hello. He said hello back, as he passed. After getting 2 steps passed me, he stopped, and reached into his pocket. It took him a while before he pulled his hand out. Neither one of us said a word. When his hand emerged, he had about 50¢ in change. He was about to hand it to me, and then he saw what the sign said. We exchanged ‘Have a nice day’s, and both marched on. About 10 minutes later, another man walked by. He was also surprised when I told him I wasn’t doing it for money. He had a cardboard sign of his own, and was actually planning to sit at the same corner & ask for money. I told him I didn’t mind at all. Before he completely walked away, I was wondering if me standing there would help, hurt or have no impact on his efforts to make a buck. I said this to him, and he said he didn’t think it mattered, and that he’d be around the corner, where the cars couldn’t really see my sign. I heightened my senses a little bit with him standing right around the corner. I had placed my jacket over a railing right by the intersection, and shortly moved it closer to me, up the road a bit, so I could keep an eye on it. I got a much different vibe from this guy than I did the previous man I spoke with. Over the next 30 minutes, there were 2 times where he left his post, and slowly walked by me, as if he was leaving. Both times he slowed right as he passed my jacket. He was between me & the jacket, and each time this occurred, I looked back at him until he passed. After another 10 minutes went by, he did the same thing, passing me slowly, between my jacket & me. After getting 5 steps passed, he turned and said, “Do you know if it’s supposed to rain like this all night?” (Where’s Andrew Friedman when you need him?) Wishing I could be more helpful, I honestly told him that I just didn’t know. He then walked back by me, slowly, as if he was wondering or lost, and returned to his post yet again. I tried my absolute best to judge this guy not based on the fact that he was homeless (or at least I’m assuming that’s why he was asking for money), but in the same manner I would draw assumptions about anyone, anywhere, in any situation—first, with keen observation, and then my gut feeling based on those observations. And I am confident that’s what I did. There were 2 times where parents were driving with kids in the car (under 10-yrs-old), and the kids rolled down their windows to wave & say hello. The parents also had big smiles on their faces, but they were no match for the kids’ elation. Something about the kids’ enjoyment of it moved me more than any of the adults who showed their appreciation. I wonder how I would’ve acted as a kid if I saw that. Should we tip our hat to the parents of those kids, for raising happy, open-minded, outgoing kids? Or do we chalk it up to kids just being kids? I do think there’s a certain ignorance that cannot be overlooked. Those kids have probably experienced very few, if any, homeless people on the street holding cardboard signs. They don’t jump to the same conclusions that many adults do, and that some people in their cars assumed about me… that I was standing on the corner, holding a cardboard sign, for one reason, and one reason only: to ask for money. As adults, we’ve had more time to experience life. For some of us, this experience has opened our minds to incredible things, amazing people & some of the most beautiful acts of kindness the world has ever seen. For others, unfortunately, this life experience has infected minds with fear & pessimism. It’s the same life we’re living. The only difference is how we choose to let it affect us. While the entire hour was very uncomfortable, I was caught off guard by how quickly & consistently my confidence rose & fell. I would get 3 honks & a bunch of smiles in a row, and the next traffic light cycle, 4 cars stopped, easily in view of the sign, didn’t even look over at me, even after a big smile and a wave. There were definitely more smiles, waves & honks than there were negatives. There were some people who saw the sign & showed no reaction. Others neglected to make any eye contact. But I’d venture to say, of all the people who made some kind of effort to notice me, easily more than 50% smiled/waved/honked. Probably close to 75%/25%. I’ve been shot down before (by colleges, my parents, prospective employers, conference organizers, girls, you name it). But never like this. Nearing the end of my hour on the corner, a man was walking by with a small bag of something he had just bought, and an umbrella over his head. I (made the mistake? of) didn’t clearly show him my sign before I asked him a favor. 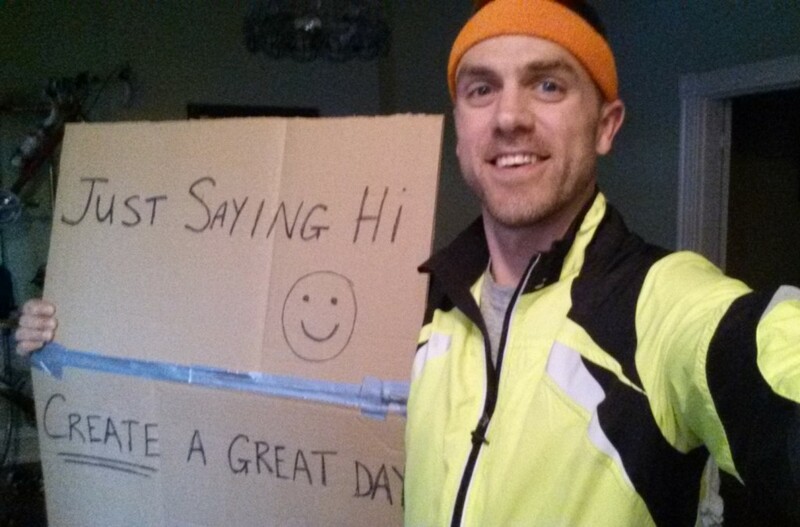 His response was similar to that of millions of people around the world every day when they encounter a person on a street corner holding a cardboard sign. He barely glanced up at me, looked down to the ground & silently shook his head no. He did acknowledge me again, very briefly stopped, and said [something like this, it was tough to hear him], “Yeah. Is that all?” But he turned right back around & kept walking. I tried to hold my sign in his direction so he could read it, but I don’t think he gave it enough time. Or he didn’t believe me. Or he just felt uncomfortable (if it’s that last one, dude should spend an hour in my shoes & then we’ll ask him about uncomfortable). Did I wave at certain types of cars over others? Did I smile more at men, women, caucasians, african americans, BMWs, pickup trucks, etc.? As best I could keep track in my head, here’s how I would break it down. Type of vehicle didn’t seem to matter. I got positive responses from old cars, new cars, luxury cars, SUVs, pickup trucks, and even the UPS guy. One of the few breakdowns where I noticed a lopsided response was age. While I got positive & negative reactions from both younger & older people alike, it seemed as though more younger people showed a positive response. And even those whom didn’t show a positive response, many more younger people put an effort in to read the sign (turning their head, looking over their shoulder), regardless of their reaction. …might actually have been holding a smile non-stop for one hour. Before I started walking back to my car (about 2 blocks), I thought about giving my sign to the homeless guy who was still on the adjacent corner. He had a really small cardboard sign (not sure what it said). I don’t know if mine would’ve helped, or how he would’ve used it, but it would’ve been a nice gesture. The only reason I didn’t was because I still wanted a picture of myself holding the sign. I wish I trusted the homeless man enough to ask him—and believe me, I definitely thought about it—but my gut told me not to. I stopped at the gas station on the next block/corner, and before I could even ask someone, a woman looked up from the pump, smiled, and said hello. She saw me on the corner with the sign a few minutes prior, and asked why I was doing it. I briefly explained, and then asked if she’d take a picture. She kindly agreed. After the photo opp, one more gentleman approached. He was just making light conversation, also curious as to why I was doing it. We talked for a minute, shook hands, and went on with our evenings. Looking back, there are a few things I wish I had done. Walked back to offer the homeless guy my sign. It was a tiny bit out of my way to walk back to the corner, but it could’ve made a huge difference. Walked a little farther up the street, away from the intersection, closer to where the cars were stopped. I was afraid they’d think I was asking for money (dumb excuse, I know), and just really shy/nervous to interact with people. a) Bring a boombox, a friend (preferably Ellen DeGeneres) and a sign that says “Dance Off!”, and, well… dance. b) Offer to give people something. Perhaps, a smiley face sticker, or a hand-written card. So… would you give this a try? How might you approach it differently? And yes, I’d 100% recommend you try it. Please be safe, do it on a well-traveled corner, in daylight, and let others know where you’ll be & when you’re returning. Use your best judgement if & when talking to strangers (yup, the same thing mommy taught you when you were 5 still applies).